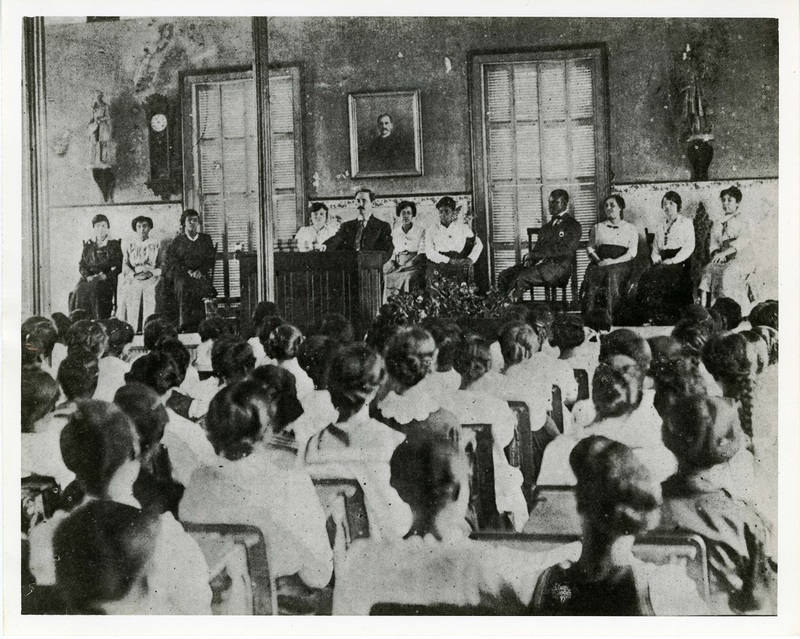 Principal Benjamin Cox addressing the student body during a meeting in Avery's auditorium with faculty seated behind him, Charleston, South Carolina, ca. 1916, courtesy of the Avery Research Center. 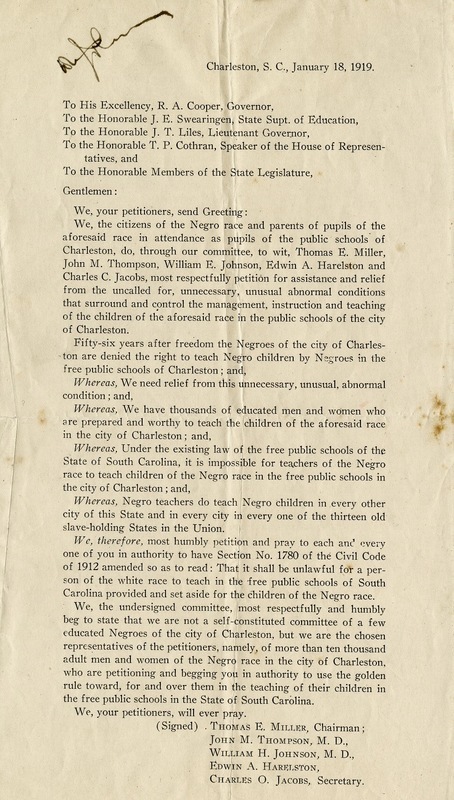 Letter from Black leaders in Charleston to South Carolina politicians requesting that they overturn the city ordinance preventing Black teachers from teaching in Charleston’s Black public schools, Charleston, South Carolina, 1919, courtesy of the Avery Research Center. The appointment of Benjamin F. Cox as Avery’s principal in 1915 marked a watershed moment in the school’s history. Cox, a graduate of Fisk University in Nashville, Tennessee, had experience running AMA normal schools in Georgia and Alabama. At Avery, he became the first Black principal to head the school on a permanent basis since Francis Cardozo, and he served until 1936. During that time, Avery’s teaching corps also became entirely Black. Increasingly strict segregation laws and customs prohibited different races from living together in the same household, which forced Avery to release the last white teachers from its faculty residence in 1915. Like Cardozo before him, Principal Cox engaged in political activity. In 1919, Reconstruction-era Congressman Thomas E. Miller approached Cox with a proposal sponsored by the National Association for the Advancement of Colored People (NAACP) to replace all white teachers in Charleston’s Black public schools with Black teachers. At that time, due to a citywide ordinance that privileged the employment of white women, only whites could fill coveted teaching positions in Charleston’s public schools. As a private institution, Avery could hire African American faculty, but Avery graduates often had to leave the city to find work in public schools throughout the surrounding Lowcountry region. With Cox’s blessing, Avery teachers and students undertook a massive and unprecedented canvas of Charleston’s Black community. They successfully obtained thousands of signatures supporting the NAACP’s proposal. Within two years, Black teachers and principals staffed the city’s Black public schools. Many of these educators were Avery graduates. Their presence promoted racial solidarity within Charleston’s Black communities and encouraged student interest in African American history and culture. 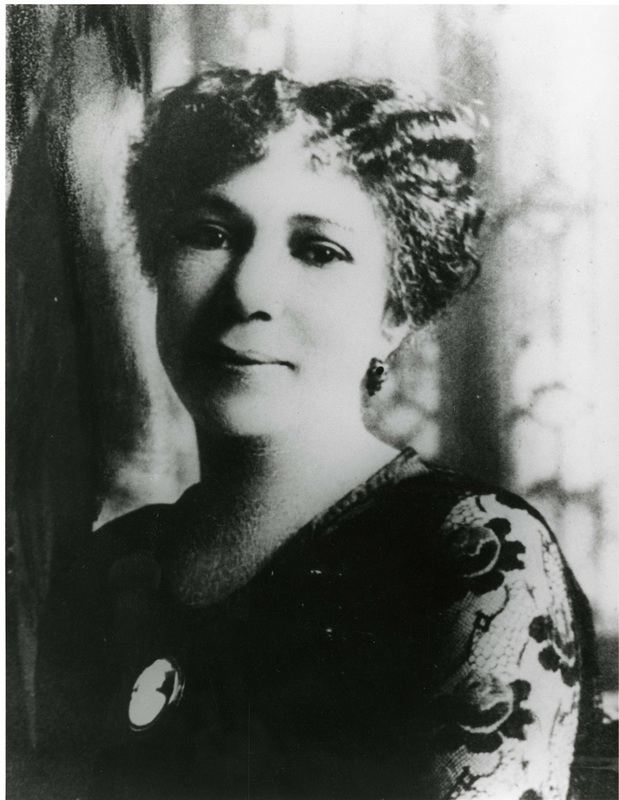 Jeannette Keeble Cox, founder of the Phillis Wheatley Literary and Social Club and wife of Avery principal Benjamin Cox, Charleston, South Carolina, ca. 1915-1936, courtesy of the Avery Research Center. Working with his wife, Jeannette Cox, Principal Benjamin Cox promoted Avery’s social uplift philosophy to students by supporting history, literature, and speech as essential subjects for the development of culture and “character.” In addition, the Coxes encouraged students to participate in extracurricular activities, such as drama, music, athletics, and other club organizations. They further ensured that mandatory chapel services and lectures exposed students to Christian moral and religious ideals. Cox’s emphasis on students developing a “spirit of service” also translated to social activism. In the 1920s, a group of Avery graduates became involved with the Charleston Interracial Committee (CIC), which formed under the Young Women’s Christian Association (YWCA) in response to a series of race riots that took place in cities across the nation during the "Red Summer" of 1919. The first of these riots occurred in Charleston in May 1919, in the months following the end of World War I, when white U.S. Navy sailors attacked Black residents, killing three men and injuring many others. Successful endeavors that grew out of the CIC include: developing a night school for Black Charlestonians; hiring a truancy officer to enforce school attendance; and Susan Dart Butler's pioneering efforts to start a private library for Charleston’s Black community. This initiative eventually evolved into a free public library system for all Charlestonians, funded by the Julius Rosenwald Foundation. In addition, the Coxes personally engaged in social activism. When Avery graduate Edwin "Teddy" Harleston formed a Charleston branch of the NAACP in 1917, Benjamin Cox served as a charter member along with a number of Averyites, and the school became a safe haven for the organization. 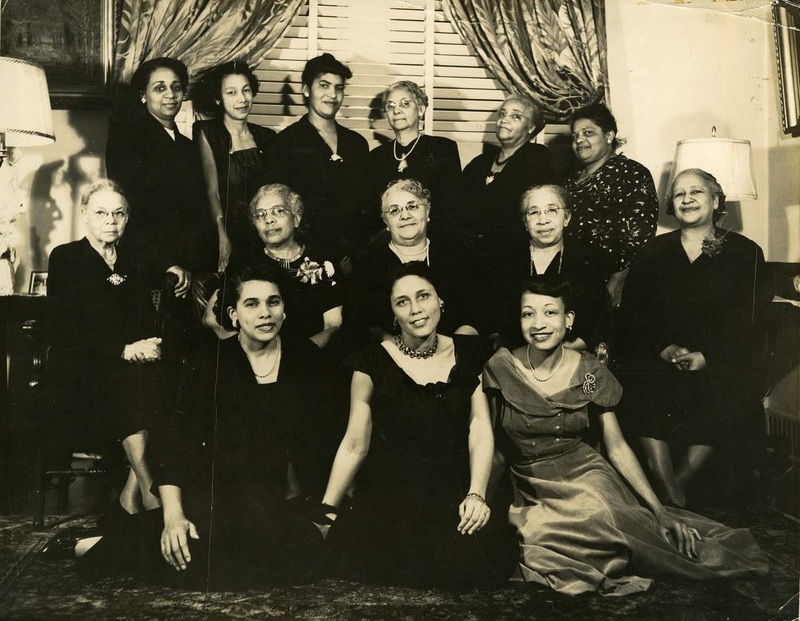 In 1916, Jeannette Cox also founded the Phillis Wheatley Literary and Social Club with a number of Averyites as part of the national Black women’s club movement. Its members primarily focused on literary and philanthropic pursuits, but they also supported anti-lynching campaigns and contributed financially to the NAACP. Phyllis Wheatley Literary and Social Club, Charleston, South Carolina, ca. 1950, courtesy of the Avery Research Center. Jeannette Cox helped establish this organization in 1916 as part of the national Black women’s club movement. The club thrived throughout the twentieth century and remains active today.